Many decades has been passed since enforcing of Dowry Prohibition Act,1961, in India but still it is claimed by the NCW and Government that Dowry menace is ever increasing in the society as the cases registered under this Act is increasing. The NCW & Government needs introspection here about their stats and wisdom. Until National Commission for Women(NCW) is close down or disoriented. Until Country is not forced to be run by feminists. Until legislatures change their feministic view about family & marriage matters. Until Courts realize their duty to take cognizance of Perjury (if any) against parents of bride. Until the dowry givers are punished. Until the IPC 498a is scraped. Until the word “dowry” is used for every trouble caused to a woman. Until every death of married women is termed as Dowry Death. Until unscrupulous women are entitled for maintenance. Until child custody is primarily the right of woman. Until Domestic violence is attributed only to husband. 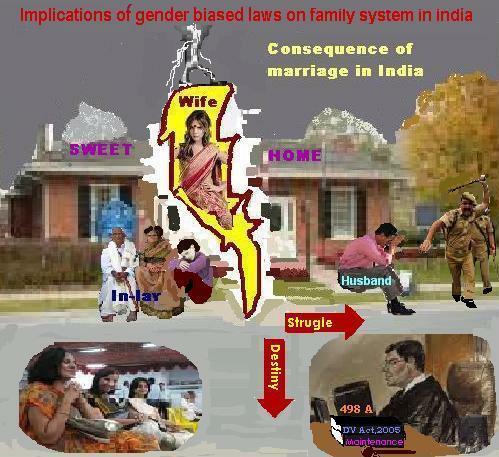 Until matrimonial laws are gender biased. Until Woman Empowerment is done at the cost of womanhood. Until false allegations has edge over truth legally. Until Men Welfare Ministry is formed. Until the existence of myth that India is a male dominating society. Until a true gender neutral study & research is done on violence in family & matrimonial matters.